150 qty. plastic greenhouse/nursery pots! 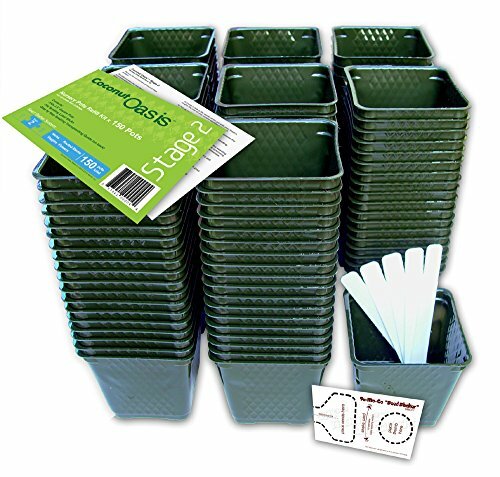 Each plastic pot measures: 3-5/8" square x 3-3/8" high. Universally BEST size for all young plants. Now Includes TEN Plastic Plant Labels! (5" long). Also includes "Step by Step Transplanting Guide" (© Xero5) & 'Seed Shaker' Card (© Xero5) to get your garden started on the right track, see pictures for details! Drain holes at bottom of each pot. If you have any questions about this product by Coconut Oasis, contact us by completing and submitting the form below. If you are looking for a specif part number, please include it with your message.